I had these as a possible Shoe Of The Day way back when I first saw them. Then completely forgot about them until I had to start looking for work shoes in the sale. And what a bargain they have turned out to be! The burgundy ones (pictured) are down to £15 from £58, while the black ones are down to £25. 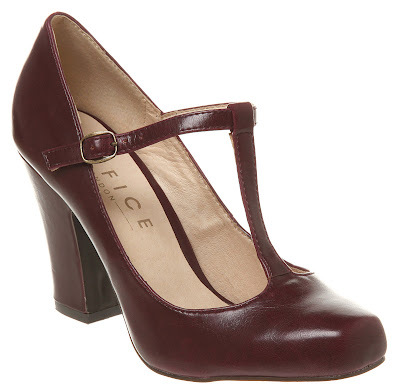 I love the retro styling of them and the block heel means that they shouldn't hurt too much by the end of the day. Very important when you need to concentrate on your work rather than how much your feet hurt. The square toe adds a twist to a shoe that would otherwise be fairly ordinary with a rounded toe. Don't be swayed by 'trends' on toe shapes. Trends are too fickle to be relied upon for work. These are so sophisticated I love the colour and the curvy shape.